Bauer College held its second annual Bauer College Financial Symposium on April 13 to help promote financial literacy to students from kindergarten to college level and to the Houston community. Having a financial plan in place may seem overwhelming if you don’t know where to start. As student loan debt reached the $1 billion mark and continues to grow, many students are looking for answers to ease considerable stress on their finances. 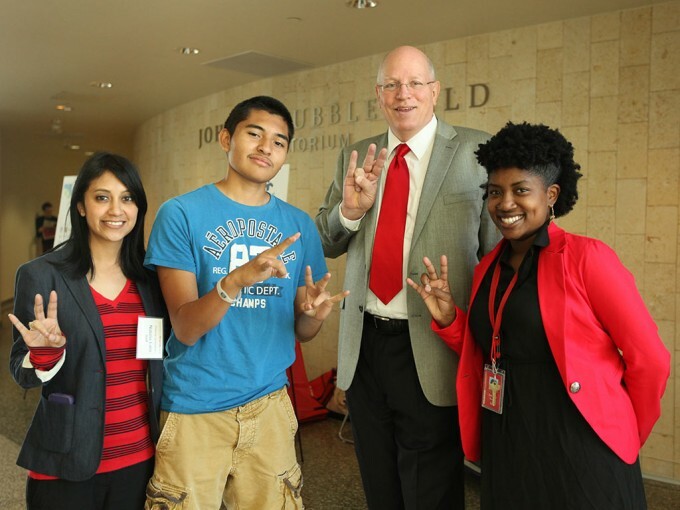 With a goal of increasing financial literacy on campus and in the Houston community, the C. T. Bauer College of Business at the University of Houston aimed to simplify the process during its Second Annual Financial Symposium on April 13. The event focused on building a financial foundation and making a blueprint to successfully achieve financial stability. Organized by the college’s Program for Financial Literacy, the symposium included several facilitated sessions and activities covering a range of financial topics, including money management, understanding a credit report, embedding personal finance into education and careers in finance. “It’s encouraging to see young faces here to learn about an important topic that is near and dear to my heart,” said James Hong (BBA ’05), president of the Bauer College Alumni Association and keynote speaker for the symposium. Having a plan, setting goals and understanding “want” versus “need” is something that students should focus on in order to be successful in saving, Hong said.